Wei WuXian lay on his stomach for the whole night. 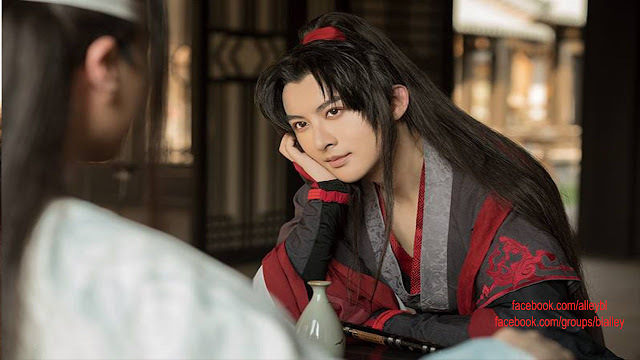 The first half of the night was spent thinking about what in the world had happened to Lan WangJi during these years, and he only drifted off during the second half. When he opened his eyes the next morning, Lan WangJi had already disappeared into nowhere. On the other hand, he lay on the bed properly, with his arms placed on the sides of his body in a position that made him seem well-behaved. Wei WuXian immediately took off the blanket that covered him. He dug the fingers of his right hand into his hair. The unexplainable feeling of absurdity and fright still couldn’t be erased from his mind. Wei WuXian, “My donkey!” Exiting the jingshi, he shooed the juniors to take him to his mount. He was led to a field of grass. The donkey was there, crying nonstop and making a lot of noise. The cries were because it wanted to eat grass, but a few dozens of round, white pompons gathered on the field, making it so that it couldn’t eat. However, as he thought of the situation of him lying on top of Lan WangJi last night, his laughter stopped abruptly. Suddenly, rings of the bell came from the the western side of the Cloud Recesses. These rings were completely different from the ones that told the time. They were hurried and violent, as if a madman was striking it. With a sudden change in their faces, Lan JingYi and Lan SiZhui both stopped joking around with him, dashing toward the bell at once. Wei WuXian knew that something was wrong and quickly followed. The sound came from a watchtower. The watchtower was called the “mingshi”. It was the building the Lan Sect used to summon spirits, with walls made from a special material and incantations carved on them. When the bell of the watchtower started to ring on its own, it only meant one thing—that an accident happened to the people performing the summoning ritual inside. Outside of the watchtower, more and more of the Lan Sect’s disciples started to crowd around, but nobody dared to go in without careful consideration. The door of the mingshi was black and made of wood. It was tightly locked, only able to be opened from inside. It was not only difficult to violently destroy it from the outside, but it was also forbidden to do so. It was extremely scary for an accident to happen during the spirit summoning ritual, since nobody would know what being it would summon or what would happen if someone broke in. And, ever since the mingshi was built, there were almost no cases where the summoning failed. This made everyone more worried. Seeing that Lan WangJi didn’t appear, Wei WuXian had a foreboding feeling. If Lan WangJi was still in the Cloud Recesses, he would have hurried over immediately, as he heard the alarming chimes of the bell, unless… Suddenly, the black door bursted open with a bang. A white-clothed disciple rushed outside, staggering and stumbling. As his legs weren’t steady, he rolled down the stairs as soon as he came out. The door of the mingshi instantly closed again, as if someone angrily slammed it shut. As soon as he entered the mingshi, Wei WuXian felt a dark energy coming over him. The dark energy seemed like a combination of the energies of resentment, anger, and arrogance, almost visible to the human eye. Surrounded by it, one’s chest would feel a constricted sense of pain. The inside of the mingshi was about ten meters in both length and width. By its corners, a few people lay motionless on the ground. The object of this summoning was set in the center of the array on the ground. It was nothing else but an arm—the one taken back from Mo Village! It stood on the ground, as straight as a stick, with the side where it was cut off on the bottom. Four of its fingers were clenched into a fist, yet its index finger pointed toward the sky, as if it was angrily pointing at someone. The steady flow of dark energy that filled the mingshi was emitted by this. Everyone participating in this spirit summoning ritual had either ran away or passed out. Lan WangJi was the only one still seated properly, at the main position on the east side. A guqin lay on his side. Although his hand wasn’t on the strings, they continued to vibrate on their own. He appeared to be lost in thought or listening to something, only raising his head as he sensed that someone came in. Since Lan WangJi’s face was always placid, Wei WuXian had no idea what he was thinking about. Lan QiRen, who was originally responsible for one section of the mingshi, now lay collapsed and unconscious on the side, his qiqiao bleeding like the disciple who escaped the mingshi. Wei WuXian replaced into his position, turning around and stepping toward the far west, directly across of Lan WangJi. He pulled the bamboo flute from beside his waist, and lifted it to his lips. During the night at Mo Village, Wei WuXian first used the whistling sound to distract it, then Lan WangJi attacked it from afar with notes of the zither. They only suppressed the arm while unintentionally collaborating like this. Lan WangJi met his gaze, a look of understanding on his face. As he raised his right hand, a melody poured out from the guqin. Wei WuXian quickly joined with the flute. The song that they played was named “Evocation”. It used the corpse, part of the corpse, or loved objected of a deceased person as a medium for the spirit to follow the melody. Usually, only one section was needed for the spirit to appear within the array. Yet, the song had almost ended, but there was no spirit being summoned. The arm seemed as if it was angered, with veins twitching visibly. The sense of suppression in the air felt heavier. If someone else was guarding the west side, they would have fallen long ago and ended up in the same way as Lan QiRen with their qiqiao bleeding. Wei WuXian was secretly shocked. It was almost impossible that the spirit couldn’t be summoned with Lan WangJi and him playing “Evocation” together, unless… Unless the dead person’s soul was cut apart alongside with his corpse! It appeared that this good fellow’s death was a bit worse than his. Although his corpse was chomped into more pieces, at least his soul was complete. Since “Evocation” didn’t work, Lan WangJi’s fingers shifted, and started playing another tune. This song had a calm melody, different than the sinister, questioning one from before. Its name was “Rest”. Because both of these songs were quite well-known in the cultivation world, it wouldn’t be strange for anyone to know how to play them, and Wei WuXian naturally followed him. The YiLing Patriarch’s ghost flute, “Chenqing”, was known far and wide. Yet, right now, with his bamboo flute, he purposely played it with many mistakes and short breaths of air, to a point where it was heartbreaking to hear. Lan WangJi had probably never played with someone with such terrible skills before. After a while, he finally couldn’t bear to continue as if nothing was wrong any longer, and raised his head to look at Wei WuXian with an expressionless face. Before he even finished saying what to stop doing, he spat out a mouthful of blood, and fell down in the same place, sinking into the deep coma yet again. He knew what followed Lan QiRen’s “stop”— Stop playing! Stop duetting! Stop tainting his favorite disciple WangJi’s guqin notes! Yet, even so, the hand still drooped gradually, under the combined forces of the guqin and the flute. Wei WuXian thought shamelessly, Although it sounds bad, it doesn’t matter as long as it works. Instantly, after the last echo of the guqin, the doors of the mingshi sprang open, pouring in a flood of sunlight. It was likely that the alarms of the watchtower stopped ringing. All of the disciples who surrounded the mingshi rushed inside, their voices calling “HanGuang-Jun”. Lan WangJi pressed his hand on the guqin, suppressing the residual sound of the strings’ vibration, and walked over to Lan QiRen to check his pulse. With him leading, the rest of the people soon calmed down. The older seniors laid the bodies of the bleeding few flat on the ground and started to treat them. As they used needles and medicine, another group of disciples carried a large bell over, intending to cage the arm inside. Although it was a bustling scene, everything unfolded in an orderly fashion. Everyone whispered softly, with nobody making loud noises. With three fingers still set on Lan QiRen’s wrist, Lan WangJi remained silent. Lan QiRen had directed at least eight hundred, if not a thousand, spirit summoning ceremonies before. Of those, a lot included fierce spirits. Seeing even he was harmed by the energy of resentment, it was clear that the amount of resentful energy within this ghost hand was unprecedentedly strong. The people suddenly realized that what he was pointing at was the ghost hand!